It looks like a threaded male to male fitting to screw into the base of the gas in post and the dispense assembly. I have an older one of these that doesn't use gas in posts. I have an older version that I took apart. There is a threaded male part that screws into the diptube assembly. I have removed it before and it contains a poppet of some description. I am wondering if I could find a gas in post that would fit the thread? What is it out of interest? 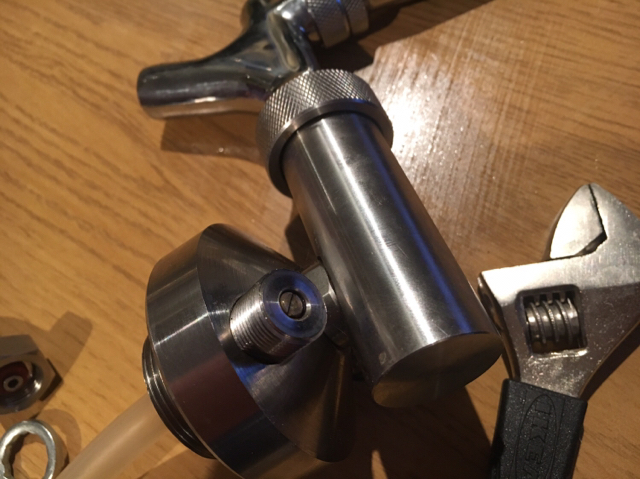 Corny adaptor for some other keg type? 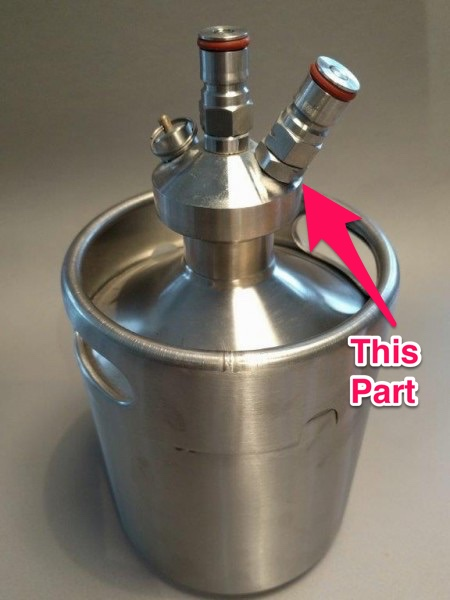 There are a number of basic designs for 2L/4L/5L mini keg growlers that are taking over the growler/portable keg market. The easiest source of them in the uk is from Mr Lard. But they show up around the web in various forms. The key difference here is that the entire dip tube/spear assembly is removed from the keg, and screwed in, and both gas in, and beer out are part of this assembly (and PRV). 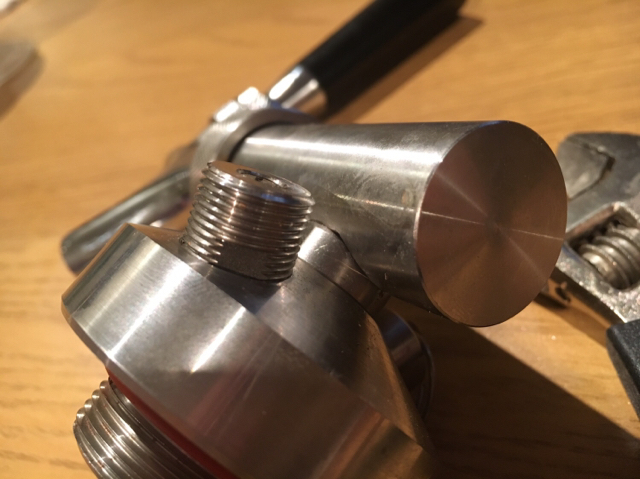 The kegs themselves come with a cap and washer that forms a very good seal, sufficient for conditioning in the keg. I have an older design that appears to be short lived or unpopular, where a lot of fiddly parts connect the regulator to the gas in connector. The first picture shows a more contemporary design that standardises around corny gas in/beer out posts. BUT there is a part between the post and the dip tube assembly that I am trying to identify. 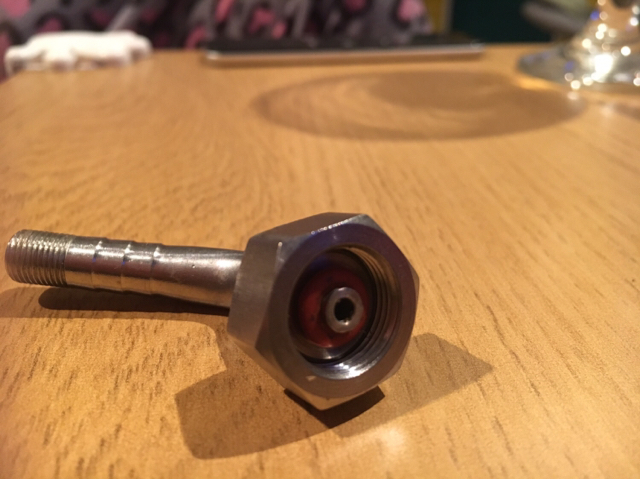 My hope is that is some kind of male - male threaded fitting that the gas in post screws onto, and I may be able to source it and convert my oddball gas-in solution, to a more standard gas in post. Because then I can take better regulated CO2 from multiple sources, many cheaper, and it opens up possibilities for multiple individuals to set up a mini bar of sorts with less fuss than usual. You can take that off with a wrench and replace it with a poppet. Beerkat (Aussie based supplier) sell both types of spear heads where poppet and barrel type are interchangeable. The tricky part is not ripping the threads getting it off the spearhead. Cost about $10 here in Oz to replace it. Email the guys from either beerkat or 'All things home brew' for the specific name. TheSumOfAllBeers wrote: There are a number of basic designs for 2L/4L/5L mini keg growlers that are taking over the growler/portable keg market.